Genetically altered for an increased mental capacity, Axis Gorillas also possess both Herculean strength and bestial savagery that they are forced to direct against Allied targets in battle. Axis Gorillas have the Blutkreuz Ape ability, which means only a hero with this same ability can join their squad. Luckily for the Axis Gorillas, their fearsome and intelligent leader Markus (available in Operation “SeeLowe”) can join his simian brothers. 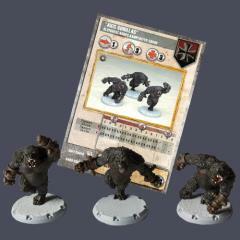 Allied units are advised to kill Axis Gorillas on sight or keep a distance as their monstrous attacks are brutal enough to destroy both squads and walkers of any strength in close combat. They may not specialize in ranged weaponry, but their Fast ability allows them to quickly bear down on Allied troops. Don’t be surprised to see a pack of these masterfully painted, enraged gorillas tearing apart an Allied walker with a sickening ease.